Commander, Naval Base Kitsap is the official sponsor of this project website. Questions regarding its content may be directed to Naval Base Kitsap Public Affairs at (360) 627-4030. This website is intended to facilitate public awareness of and participation in the National Environmental Policy Act (NEPA) process for the U.S. Navy Land-Water Interface and Service Pier Extension (LWI-SPE) project at Naval Base Kitsap Bangor, located in Silverdale, Kitsap County, Washington. In accordance with NEPA, the Navy published a Final Environmental Impact Statement (EIS) for the proposed LWI-SPE project in July, 2016. On September 14, 2016 the Navy issued a Record of Decision (ROD) regarding the Final EIS. The ROD selected the alternative that the Navy will implement for the LWI portion of the proposed action and deferred a decision on the SPE portion of the action. Therefore, the NEPA process for the LWI project is now completed, and the Navy will proceed with implementation of the LWI project as described in the 2016 ROD. The NEPA process for the proposed SPE is continuing in the form of a Supplemental EIS (SEIS), as per the Navyï¿½s Notice of Intent (NOI) published in the Federal Register on March 10, 2017. This website continues to provide access to information from the 2016 EIS but now also focuses on the SEIS as it is developed. 20 miles (30 kilometers) west of Seattle, Washington (see adjacent map), provides berthing and support services to U.S. Navy OHIO Class ballistic missile submarines (referred to as TRIDENT submarines) as well as a SEAWOLF Class submarine. 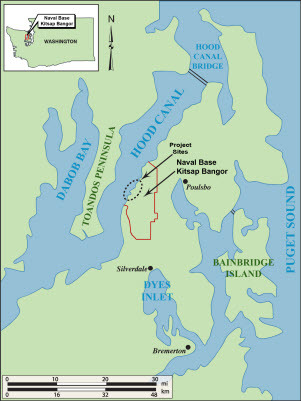 In the EIS, the Navy proposed and analyzed two projects on the Naval Base Kitsap Bangor waterfront to: (1) comply with Department of Defense directives to protect TRIDENT submarines from increased and evolving threats and to prevent the seizure, damage or destruction of military assets and (2) provide additional berthing for maintenance of existing homeported and visiting submarines. Complete the perimeter of the Waterfront Restricted Area by constructing and operating barrier structures at its northern and southern ends using either pile-supported piers or Port Security Barriers to connect the existing on-water Port Security Barrier system and the on-land Waterfront Security Enclave. Extend and operate the existing Service Pier and construct and operate support facilities to provide additional berthing for maintenance of existing homeported and visiting submarines. While the EIS analyzed both of these proposed actions, the 2016 ROD conveyed a decision on the LWI project only, and deferred a decision on the SPE until such time as funding could be allocated. The SEIS addresses the SPE project only, and evaluates impacts to affected resources based on small changes in the project design and new regulatory guidelines released since the 2016 ROD. NEPA does not require Federal agencies to establish a website. This website has been developed to provide the public with information about the project. We are striving to make this web site accessible to all members of the public by meeting the web page accessibility standards issued in accordance with Section 508 of the Rehabilitation Act Amendments. If you find a problem that prevents access, please contact the LWI/SPE SEIS Project Manager at nwnepa@navy.mil. Be sure to include as much information as you can so we can identify the problem and try to resolve it. At present, the accessibility of GIS in compliance with Section 508 of the Rehabilitation Act is limited. The inherent graphical nature of GIS and the volumes of data represented make compliance difficult. SEIS maps developed from GIS software currently do not meet the full Americans with Disabilities Act (ADA) and Section 508 accessibility requirements. If you use assistive technology and the format of these pages prevents you from obtaining necessary data, please contact the LWI/SPE SEIS Project Manager at nwnepa@navy.mil. Last updated on 14 March, 2019.